This is something that I would like to share, and hope you will spend some time to view this video. Lately, I heard many unpleasant news about people having cancerous cells. I hope after viewing this video, we'll be more selective about our food intake. This is the list of food which we should consume, extracted directly from the video, for ease of reference. Hope you saw the video and it's useful to you. The food listed is a good guide. While such food is good, we have to bear in mind not to over-consume them. The keyword is 'moderation'. I'm afraid I cannot agree with you on these. There are some foods which we should take in moderations. However, for fruits and vegetables, I feel that these can be taken daily, and preferrably 3 servings a day. So sorry, moderation yes, to a certain extend and depending on which food category (fruits/veg, cereals, protein, fats etc). Hi Jane, thanks for sharing this! 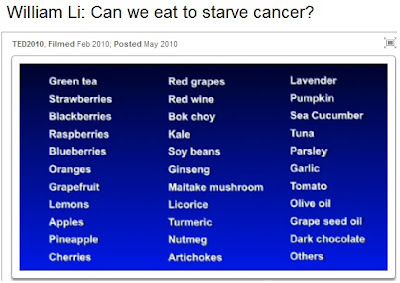 Although I may not like to eat some of the food listed, I will try to incorporate them in my diet from now on for good health. You're most welcome. Good things and information are meant to be shared. Yes, sometimes for health purposes, we need to consume some of the foods which I usually try to avoid. Thanks for sharing such good things. I have also put up the video and list of food on my blog, more to remind myself and also to share with my friends. Thanks for your compliments. Ya, do remind yourself about the goods and bads of foods.